Temperatures in New York City and other urban areas are typically warmer than in the surrounding countryside. A phenomenon called the urban heat island effect is the cause; air quality, public health and energy demand are all affected. NASA researchers, using NASA satellite observations, weather pattern data and computer models, have recently assessed how well city officials, activists and community organizations are doing in reducing the effect in NYC. Their results were discussed during the 2006 American Meteorological Society’s annual meeting in Atlanta, Ga., which took place last week. 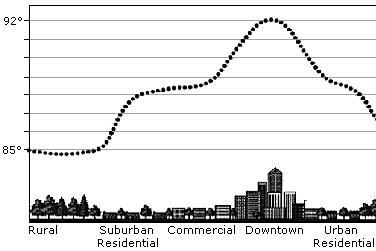 The heat island effect in cities is caused by the non-natural heat-absorbing materials used in enormous buildings, streets, sidewalks and other public works. According to the NASA study, the heat island effect in urban areas can be most effectively reduced with more green space (vegation offers moisture to cool the air). Also, light-colored surfaces can reflect sunlight, and should be used on rooftops. As you know, science fiction writers often take a larger view of problems. For example, in his 1970 novel Ringworld, Larry Niven had to help an entire species, the Puppeteers, sentient herd animals whose vast cities and works covered their entire planet. What can you do for a species whose entire planet is a heat island? Take a look at a couple of stories about solving Earth's warming conditions; Reduce Global Warming By Blocking Sunlight and Space Ring Latest Implausible Warming Solution. Read more about heat islands at ScienceBlog and NASA.